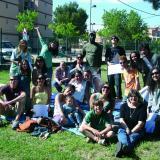 The Audio Gil Spanish Institute is perfect for all those wishing to learn Spanish in the most effective and enjoyable way, whilst spending their time with people from all over the world. Audio Gil Spanish Institute is the largest training centre in Castellon de la Plana. Thanks to its recent expansion, the centre has now a total of 1,200 square meters of facilities spread over nine classrooms for theory classes, four computer labs, a laboratory of computer-aided design, library / video library, staff room, offices, and general services. It also features all the security measures required for a building of this size. The Spanish for Foreigners Department focuses on developing Spanish programs for all levels and it is distinguished by the quality of teaching and the professionalism of its staff. It is integrated in the International Department, and under the direction of multilingual professionals, is responsible for coordinating all aspects of the courses. The modern facilities of Audio Gil Spanish Institute are located just minutes from the historic centre of the city of Castellón de la Plana. Nearby are numerous tourist and cultural attractions, such as the Ribalta Park (a garden of deep tradition in the city), the bullring, and the old railway station. Tourist Area: Castellón Costa Azahar. Languages: English, German, French, Chinese, Japanese and Russian. Activities: Tourism, leisure, arts and sports. Levels: elementary (A1, A2), intermediate (B1, B2) and advanced (C1, C2) according to the CEFRL - Common European Framework of Reference for Languages. Pupils’ level is determined by the qualification supplied by the pupil and by an initial test carried out by the teaching staff. Courses: Courses last a minimum of one week. Lessons are 55 minutes long. Spanish + Culture: 30 hours a week Individual ONE TO ONE Spanish lessons with practice sessions in a business. Courses with specific aims: Spanish + Business, Spanish + Preparation for the DELE. “Spanish +” special courses: Combining Spanish lessons with courses in IT, office software, design, programming, business administration, electricity, electronics, marketing and languages (English, German, French, Italian, Chinese and Valencian). In addition, all pupils can put their knowledge into practice at the Tandem evenings, in which they can make linguistic exchanges (Spanish – English + Spanish – German...) with the centre’s Spanish pupils. Audio Gil Spanish Institute organizes accommodations in Castellón de la Plana according to the needs and preferences of the student. Thus, the school makes the necessary arrangements to stay in a luxury hotel, a comfortable guest house, a shared apartment in the city or on the beach, or living together with a hospitable Spanish family carefully selected by the school, the latter being the way most requested and effective to complement the learning of Spanish language. Living with a family not only offers comfort (single room, guest laundry and meals included), but also the opportunity to continue practicing Spanish outside the classroom, within the customs of the Spanish everyday life. Pupils of the Audio Gil Spanish Institute can enjoy the cultural, sports and leisure activities offered in Castellón de la Plana and its environs: the beaches of Benicàssim, Peñíscola and Oropesa del Mar or nature spots like Las Palmas desert and the Columbrete islands. On the first day of the course, the school offers all students a guided visit round the city with no additional cost.